Sturdy, functional, beautiful patio furniture can bring luxury, style and comfort to your outdoor living space. A carefully placed outdoor café table, for instance, can be the focal point of your patio, transforming your family’s outdoor space into a classy, stylish haven of fun and relaxation. If you live in Brisbane, Sydney or other parts of Australia, then getting quality outdoor furniture such as café tables, lounge sets, rattan sunloungers and outdoor barstools is easy. There’s no need for you to look very far to find a reputable outdoor furniture retailer in Sydney or Brisbane to help you get things sorted out. In other words, you don’t have to spend a fortune to give your family the comfort and luxury they deserve. Just follow these simple tips we’ve outlined for you – step by step – to find the perfect café table for your patio. Knowing what you need, want or how much you can afford makes a big difference in choosing the right outdoor table for you. Café tables for patio, for example, come in a wide array of sizes, materials and designs. The material your café table is made of determines, for the most part, its durability, affordability and aesthetics or how well they are able to blend with your other patio furnishings. So your outdoor café table can be made of metal (such as wrought iron or aluminium) wood, plastic or rattan. Affordability varies with each material. Also each material has its pros and cons. The next step will help you zero-in on the most appropriate material for your needs and budget. With proper care, outdoor iron café tables can last for years. However, iron is prone to rusting and can deteriorate quickly within a year or two if not cared for properly. Rattan. This material can be sensitive to rain and moisture where mould and mildew can quickly develop when not allowed to dry properly. On the plus side, rattan is not only affordable, but also a great material if you can provide the required amount of care such as using waterproof furniture cover to protect your outdoor café table against rain and moisture. Wood. There are expensive wood types and then there are cheaper ones. The thing with wood is it can be expensive to maintain as well. And if not cared for properly, your once beautiful café table for patio will quickly succumb to the elements and deteriorate prematurely. Wood’s unique charm lies in its natural beauty. If you think you can provide the higher level of care required by outdoor wood furniture, then go for it. Plastic. The major selling point of plastic café tables and other plastic furniture items is that they are extremely affordable. Another thing worth noting about plastic café tables for your patio is that they come in various colours, styles and designs. If you like to change your patio furniture every year, then plastic is a viable option for you. The downside is, unlike wood or iron; plastic may have limited weight-bearing capacity. Plastic also tends to be more prone to cracking and fading than other types of materials. But considering how affordable they are, plastic café tables and chairs are easy to replace, making them almost maintenance free. So, all is good. Buying quality café tables for you patio will ensure you’ll be able to enjoy your investment for many years to come. So buy with care. Visit furniture showrooms. Ask lots of questions and check out customer reviews before buying your items. All in all, consider what fits your tastes, budget and preferences. Apply the same criteria to your patio table and furniture as when buying your indoor furnishings. 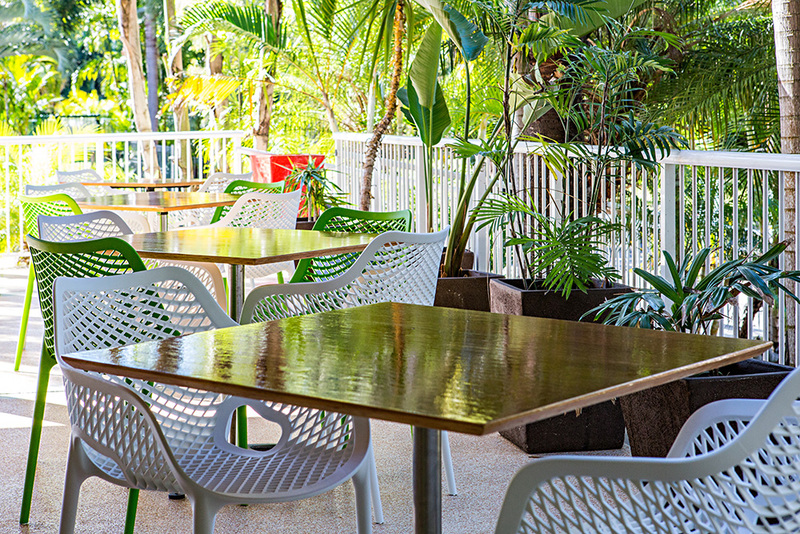 If you would like to know more about our outdoor café tables and patio furnishings visit our Website and also our Brisbane and Sydney showrooms. So regardless of whether your taste is modern or traditional; or whether you favour sharp angles over delicate lines, we have the right fitout and furniture solution for you. Find out what you’ve been missing all this time.